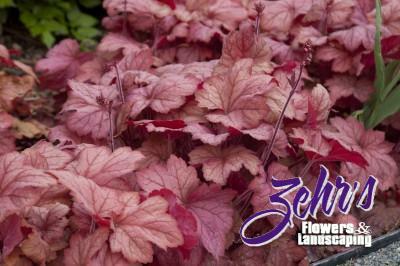 Huge peach colored leaves with a showy white overlay forms lush clumps to highlight shaded perennial borders, rock gardens and containers. Foliage becomes rose to rose-purple from fall through winter. Creamy white flowers stand on wispy stems in spring. Evergreen in warmer climates. Thanks to the H. x villosa blood, will grow well in southern humidity or the damp Northwest.